Oh my goodness, I've finally finished my Level 8 workbook, and put it in this website's shop. I hope it fills what I see as a gap in the market for systematic spelling activities which help learners understand and manage syllable boundaries and vowel spellings in multi-syllable words. 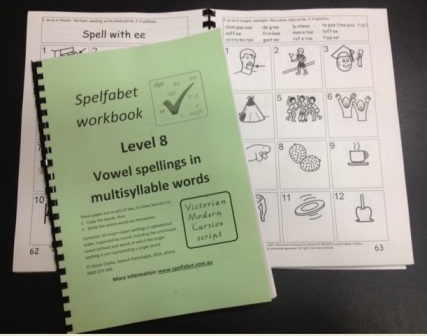 It's my longest workbook yet, with 194 pages, designed for literacy learners who have grasped the basics of vowel spellings in one and two-syllable words but want to build on this, and really get their heads around the main sounds for each major vowel spelling. There is a brief video tour of this workbook on YouTube – click here to see it. The workbook covers the following vowel spellings in multisyllable words: a, a…e, ai, air, ar, are, au, aw, ay, e, e…e, ea, ear, ee, eer, ei, er, ew, i, i…e, ie, igh, ir, o, o…e, oi, oo, or, ou, ow, oy, u, ue, ur, ure, y and y…e (see below for the full list of sound-letter relationships covered). Some of these spellings have only one major sound, but some of them have four or five, like the “i” in "dinner", "giant", "media", "exit" and "onion", or the “y” in "bilby", "cycling", "symbol", "yabbies" and "oxygen". Often something that looks like a single vowel spelling in a long word is actually not, for example the "a…e" in "karate" and the "o…e" in "anemone". The workbook also covers “os” plurals as in banjos, kilos and videos, as well as “oes” plurals as in dominoes, heroes and tomatoes. It also looks at the way the letter “u” represents the sound “w”, in the familiar “qu” spelling, but also after “g”, as in iguana, language and penguin. All activities incorporate pictures to make them meaningful and help build vocabulary. Pictures are simple, computer-generated line drawings, mostly from the Picture Communication Symbols by Dynavox-Mayer Johnson, and are used with permission. This workbook downloads as three separate pdf files (I tried loading it as two files, but that sent my shop into a paroxysm) and is available both in Comic Sans font and Victorian Modern Cursive Script. This entry was posted in phonics activities, sound-letter links, spellings, word attack on June 25, 2013 by alison.